Ziconic Faces Adios Reality at Santa Anita: Zenyatta’s son Ziconic makes his career debut on Saturday at Santa Anita Park in Race 3. A gorgeous-looking 3-year-old son of Tapit, Ziconic brings high hopes as the foal of two immensely popular horses in the racing world. Fans will be pleased to know John Shirreffs and Mr. and Mrs. Moss, the same connections for Zenyatta during her career, are behind Ziconic. 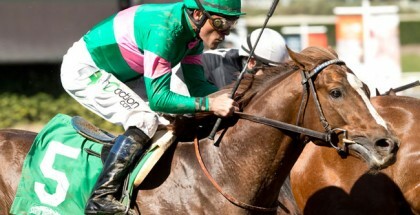 Hall of Fame jockey Gary Stevens takes the mount. Can Ziconic win? Positive signs are in his corner. For one, Ziconic debuts at an earlier time than his sibling Cozmic One last year, and this can be taken as a sign of confidence by the ultra-conservative trainer. In addition, comments from the trainer and others indicate talent is there. “He’s been training very good. 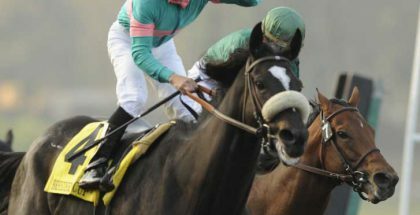 Mike Smith breezed him this morning and he liked him,” Shirreffs said. Even professional clocker Bruno de Julio (someone who sells morning workout reports for a living) believes Ziconic can run better than Cozmic One. He never believed Cozmic One had ability. The hype behind Cozmic One’s career debut was unprecedented for a maiden, with the exception of the $16 million dollar The Green Monkey. Rarely does a maiden with zero starts receive full columns from turf writers. Yet, Cozmic One inspired much talk. Cozmic One’s hype, if anything, showed how much fans love Zenyatta and want to support anything related to her. Morning workout reports told he had nothing, and a modestly-talented runner Smart Transition (ironically the son of Zardana, Zenyatta’s stablemate) regularly outworked him. Yet, he went off under 2-1 in his career debut and finished last. While the same scenario is possible this weekend, Ziconic has Tapit as a sire instead of Bernardini and maybe Tapit’s influence works a little better for this family. Bernardini sired Eblouissante, Zenyatta’s half sister, and her career did not exactly pan out. Tapits generally become more successful. Tapit also sired Adios Reality, the main challenger to Ziconic. 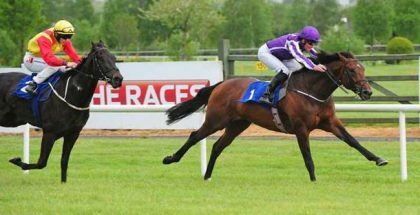 He boasts a royal pedigree too as a son of Dream Rush. All three of her other foals (Dreaming of Julia, Atreides, Perchance) broke their maiden, making it likely Adios Reality finds a way to improve. Powerful connections are behind Adios Reality, such as trainer Bob Baffert and Stonestreet Stables. Rafael Bejarano hops on board again, despite the colt’s 24-length loss in his debut. Handicappers are going to knock the 24-length loss, but think about all the horses who started off their careers poorly and went on to show their talent, such as Rags to Riches and Rachel Alexandra. Most horses need one race as a learning experience. Adios Reality owns an interesting worktab as well, with his only bullet workout coming after the failed debut. Maybe Adios Reality woke up and realized what the connections want him to accomplish. The rest of this field ranges from hopeless to confusing mystery. One More Round simply has too much to overcome going from a maiden claimer to this spot. Similarly, Dalmore appears slow too. If either of them win, it will reveal the weakness of this race. Fast Munny, another first time starter, has Munnings as the sire and a decent first-time out trainer in Craig Dollase. Can’t Remember, Adios Reality’s stablemate, finished in front of his fellow Baffert runner in the same maiden race. But, when horses lose by 20 or 30 lengths, analyzing a few lengths in difference makes no difference. Rounding out the field, the Jerry Hollendorfer-trained Snicker can disappoint Ziconic fans too, if only because Hollendorfer seems proficient with first timers. In wagering, it looks as if Ziconic, Adios Reality, Fast Munny and Snicker are the top four horses to consider. Fans might want to place a wager on Ziconic in order to show their support for Zenyatta, and there is nothing wrong with that. Just be aware of the attention Ziconic will receive leading up to this race and how it affects value. Zenyatta’s son Ziconic makes his career debut on Saturday at Santa Anita Park in Race 3. A gorgeous-looking 3-year-old son of Tapit, Ziconic brings high hopes as the foal of two immensely popular horses in the racing world.